If you wake up and check email while you watch the news, don’t be surprised if you feel frazzled and stressed by noon. I remember being glued to the TV, watching national or local stories unfold before my eyes. Sometimes that took hours and other times, days or longer. I usually felt broken after breaking news. The big stories of loss and suffering seemed to much to absorb and the small local stories of robberies, assaults, fires and floods, scams and schemes left me feeling depleted,hopeless and helpless. There is so much good happening in the world, but it’s not as exciting as the bad stuff. The focus of news and big, breaking stories could certainly explain sleepless nights, stress and anxiety. And it’s not just breaking news. The regular nightly news will break you too. It will break your heart and your spirit. The onslaught of information about broken people and traumatic experiences can be more hurtful than helpful. While I don’t discount the importance of being informed, I think we can be over informed. 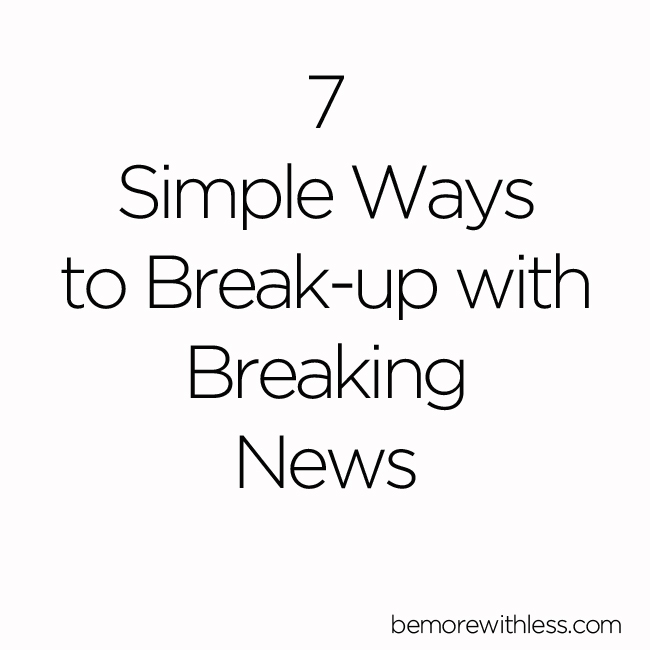 This story from Slate.com offers these great suggestions for breaking up with breaking news, “When you first hear about a big story in progress, run to your television. Make sure it’s securely turned off. Now go outside and take a walk for an hour or two. Maybe find a park and sit on a bench, reading an old novel. Winter is just half a year away—have you started cleaning out your rain gutters? This might be a good time to start. Whatever you do, remember to stay hydrated. Have a sensible dinner. Get a good night’s rest. In the morning, don’t rush out of bed. Take in the birdsong. Brew a pot of coffee. Take a regular digital sabbatical. Once a day or for a full day every week, unplug. Disconnect so you can fully connect to what matters most in your life. Change the channel. If you listen to news in your car, switch to music or silence. Disconnect from social media sites like Twitter and Facebook. This is often where the breaking news breaks. Visit your favorite social media sites but don’t stay there all day or check in multiple times a day. Include them in your daily or weekly digital sabbatical. Take a walk. Go outside and experience all of the beauty right outside your front door. Leave your phone at home. Read. Get lost in a good book or read a classic before you see the movie. Create and support good news. When you aren’t lost in bad, breaking news, you can create new projects and opportunities to help people and support people who are sharing good news. Be uplifting. Spend time with people who lift you up and then lift them right back. While these simple ways to take a break from breaking news will help, a self-imposed media fast will demonstrate the real effects of the news on your physical and emotional health. Declare a 30 day media fast. You’ll still get a steady stream of information from friends and family, but without the drama and special effects of hyped up news stories. After 30 days, you will likely feel happier, less distracted and more relaxed. Today I get my daily headlines from The Skimm. Short and sweet, but with more information available if I want to go there. Usually, I don’t. Thanks for sharing these ideas. I usually consume my news on my commute by listening to NPR or BBC. I’ll confess that a few Fridays ago, I could not tear myself away from the news in Boston. It is unlike me to obsess and get anxious over such things. I knew it was bad for me to keep my head in the news, yet I didn’t turn away. I feel like I got a difficult but effective reminder of how I should actually interact with news. I’m bookmarking this post as a reference! Boston got me too Bev and it prompted this post. When it was over, I realized that nothing would have played out differently if I had heard about it days later. I’m right there with ya, Beverly. I love my daily dose of news from NPR. I feel educated without being overwhelmed. I was absorbed on “lockdown day” as well, especially since as a Boston resident I was locked down. The news was riveting at times and we could hear sirens and helicopters simultaneously with the TV, but that afternoon I started to feel sick from staring at the screen so much. Also it was 70 degrees and sunny and it was really hard not to go outside on what was a day off! I cancelled cable television last spring and quit reading Yahoo headlines shortly there after. My college age daughter was appalled – “You have to stay abreast of current events and stay involved” she said. I understand her concern – we all want to make a difference in the world, but I don’t need to read sensationalized headlines to know that someone is hurting someone somewhere or that politicians are telling lies. I seem to have more time and energy to involve myself in the world and make a difference. Breaking News is often wrong or misleading. Better to come back to a story a few days later to get the full/accurate picture. Also, if you remove the emotion attached to breaking stories, they are pretty boring—they repeat themselves over and over and over and over again, and the trickle of new information takes a LONG time, keeping you glued to it for hours just to get a little bit more data. There is obviously a method to the madness in keeping us hooked. Great post. I usually have twitter up at work so that I can manage our account. Used to be the guy that had my iPhone out checking e-mail all the time for work, answering calls at dinner, etc… My life was so hectic. Now, when I leave work, the work phone and e-mail stay stowed away. It didn’t take long for people to realize the new boundaries I had set up and I now practice pretty much your entire list. 2. Change the Channel: Don’t drive, but don’t have cable and keep the TV off. 3. Disconnect from Social Media: Ditched my FB account 2 months ago, haven’t missed it one bit. 4. Take a walk: The best part of my day is the walk/bike ride with my wife and 10 month old son. 6. Create and Share Good News: These stories may not sell many newspapers, but if you look they are everywhere! 7. Be uplifting: This one was a struggle for me, but I’m very happy for the relationships that I’ve built of late! That is awesome Paul. It’s amazing that even though you might not be doing much less, just redirecting your attention made life less hectic. Anyhow, I don’t have a FaceBook or Twitter account… I consider myself to be a “conscientious objector” of sorts. But the TV news has a way of sucking me in, especially since I work from home. After the Marathon bombings and all that craziness, it got really bad… constantly waiting for the proverbial next shoe to fall. So, I put myself on “news probation.” I made myself a deal – I could watch a total of one local and one national news show per day. That way I could still stay up to date on the weather forecast for my garden, and follow the trades and drafts for me beloved Denver Broncos, but I didn’t have to be inundated with the craziness all day! I must say, it’s done wonders for my peace of mind! an excellent post, Courtney. I love how spot on you are on this. I’ve been off tv thus tv news for 4 years Now, and I actually listen to a book or music if I am in a waiting room which bombards already anxious or unwell people into the middle of the latest whatever that is so important. the Friday morning of the Boston thing I had a 9 o’clock appt with my doctor and there was no one in the waiting room so no tv on!! then someone came in, turned it on and it was like he was sucked into the tv like in Willy Wonka!! another person came in and she had been up all night watching and seemed to BE gasping for air to see what else was happening. I was clueless. of course, I got sucked in, who wouldn’t, right?! anyway… I have recently started to listen to Morning Edition or All Things Considered every day or so and I am noticing little shifts in that I am hearing about things that actually I don’t know that I need to know, yet others that I am glad to learn of. I’m going to continue the experiment with my eyes and ears a bit more tuned into whether I’m feeling the negative scoobah starting to overtake me. I have liked living in my little bubble. I am very careful what I let in. my biggest complaint is when I am in the market checking out and those magazine and newspapers are shouting shrilly from the right-in-front-of-my-face racks. Courtney, this topic is so close to my heart (I have a category on my own blog called “Unplug and Simplify” and those posts are quickly becoming my favorites to write). I agree with the comments here as well–especially Paul’s about stop reading Yahoo headlines. They are notorious for writing inflammatory, misleading headlines to get you to click on the article. I gave up my Yahoo mail accounts and joined Google mail just so I wouldn’t have to deal with all of that nastiness and misinformation on Yahoo. What a relief! I can’t disconnect from social media because I need it for my blog (I use FB, Twitter, etc. only for business), but I haven’t watched TV news in ages. When you watch an actual event live, such as press conferences or State of the Union addresses, you do not need to watch the follow-up news which spins it and often distorts it. I’ve found watching things directly and forming my own opinions has worked wonders! Correction: Dan said avoid the Yahoo headlines! But I agreed with Paul’s comments that breaking news is a terrible thing to follow–time-consuming and misinforming. In 2012 for Lent we gave up tv and after Lent we were so happy not watching tv that we canceled our Dish Network subscription which we had had since 2002, and gave the tv set away on our local freecycle group. Have never been happier. Yes we have a cell phone but its only used for needs. Yes, we have a laptop but its used for online classes and for checking in with friends as a rewarded when getting a certain amount of things done per day. It has also helped me better understand and appreciaate my Amish, Mennonite, cloistered Catholic nun/brother friends and Buddhist friends who don’t have a tv, or get a newspaper. While I do listen to NPR some during the day its lovely discussions about topics I care about, and not the hyped news one hears on commercial tv/radio. Love this post! I broke up with the news when I was pregnant (my daughter is almost seven). I considered journalism as a major in college, but quickly changed after one semester. I was so disenchanted with the process and what so many journalists ended up doing. While I was pregnant, the anxiety of over sensationalized news was unbearable. What kind of world was I bringing my child into? So, just like that, I stopped participating. I learned what I needed through friends and family and the 90 second reports on the radio. This practice has helped my anxiety immensely and there is room in my mind to witness and be grateful for all the good in this world. We got rid of our cable service a couple years ago and it was the best thing. It has changed my anxiety level and made my life far more enjoyable. If I do hear about breaking news, it’s usually on my own terms and when I’m ready for it and I love that I don’t have to listen to the same news over and over and over again. This article is very timely for me. My typical day includes checking my Twitter feed multiple times and checking in with the news feed on Google and my go-to news sources like NYTimes for the latest breaking news. As a former student of journalism, I nearly went down the path of becoming a news reporter, until I realized that I couldn’t handle the inundation of horrible, anxiety-inducing stories as part of my career. I still like to stay updated, but I’ve been sucked into the world of 24/7 news too many times. Just over the past few days, I’ve started to re-evaluate how these stories are affecting my life and decided that I need to change my habits so that I remove the anxiety and stress of “breaking news” from my life. I still appreciate news and I want to stay informed…just on my own terms. I stopped watching and reading news about a year ago. I don’t know what was the exact impuls (probably some post like this), but I somehow realized I don’t need it. At all. If something important happens, somebody would tell me, or I would see some headlines, and then I can make a decision, if I want to know more, or not. The true is I usually don’t want to know more. For example I didn’t know about pope abdication for a few days until somebody told me, and what happened because of it? Nothing at all. So the news stopped being part of my life, and it feels very natural to me, and just great in general. Great advice, Courtney! I talked to our staff yesterday about digital fasting. I’ll forward this to them too. Hi Courtney. I could not agree more. We recently unplugged our TV, and now we don’t have one. During this time, the tragedy in Boston happened. For the first time, I realized what I had done during all the other tragedies like 9/11. I sat and watched and cried and made myself horribly miserable. I didn’t help another living person by doing that. I did exactly what you mentioned. I read a few articles – and on one day only. I was saddened when I was tutoring my first student of the afternoon. He is a fifth grader and had been reading feeds on his phone for the past hour. He had even seen horrible pictures. How did this improve his day. I know we made the right decision to simplify and limit our news when this happened. There is such a thing as too much. Great reminders. Thank you! “I haven’t followed the news on a regular basis in years and I am still informed, educated and aware of what’s going on in the world.” That sentence of yours says it all, Courtney. We are on a permanent break from the news as of March 2013. I do not miss it at all. It is a decluttering of your brain. Anyhow, I can always depend on others for giving their opinions on the current issues in person. Cultivating this type of ignorance (not meant derogatorily) can be very healthy and peaceful. Loved your post!!! I’m on board with all of this! My job requires me to know what is happening in the world but more from an economic vs. political or social perspective. But I try to limit the duration of my daily exposure similar to radiation! I typically consume my news during a small window of time each day but not near the beginning or end of each day. No use getting up or going to bed with it. I also only pay attention to headlines on larger stories for a while and tend to wait a few days until the breathless recitation of the “facts” subsides and smart folks whose opinions and ways of looking at the world I admire have had a chance to put together some actual analysis. For this reason, I tend to prefer the pace of a weekly periodical like The Economist vs. a daily like the WSJ or NYT. We started doing tech-free Sunday mornings. It’s been an amazing experience to connect as a family, and some days we find ourselves not touching an electronic until the evening. I like this article and totally agree! One of the reasons the news is so anxiety-provoking is because the “bad stuff” is overrepresented and the selection of stories from any particular vender suffers from reporting bias. It makes the world seem worse and it’s because of what Kahneman calls the Availability Bias – people overstate the probability of bad events when they can recall more examples of them happening to mind easily. So plane crashes seem way more likely than they really are just because they’re on the news all the time. My new year’s resolution this year was No More News, especially internet news sites, because they are distracting at work, not to mention upsetting. Anything that’s important enough I’ll hear about it IRL from someone or get it specifically linked in an email by friends who know what I’m interested in. Oh, so true, Courtney! My husband is a financial and political news hound and I can’t tolerate the raised noise levels, people talking over one another, etc. Our marriage was greatly improved when I bought him a set of decent quality head phones. We now live in blissfully quiet peace. We have not had cable or network TV in our house for several years now, and we don’t have smartphones, either. I listen to public radio on my commute to and from work, and that’s enough for me to stay abreast of what’s happening in the world without getting overwhelmed by it. There is so much sadness in the news, and I find that when I look for news on my own, I gravitate more toward positive stories, anyway. To me, the definition of “being informed” has changed. I no longer know or care what the Kardashians are doing, and I have no idea what my co-workers are talking about when they reference some great new commercial. I’m ok with that. I live in the Boston area, and everything that happened at the marathon was so sad and tragic, but I couldn’t handle seeing/reading/watching it constantly in the following weeks, so I definitely needed to disconnect. This post is absolutely spot on. Life is so much more peaceful without it. I took a break from TV news when I decided to take a break and ultimately quit TV in 2012. I noticed how much lighter I felt from not being dialed into the news, so I did the same with online news. My life is infinitely better without knowing everything that’s going on with the world. Most of the news is negative, and in my experience, it can make you feel stressed. Even now, I notice the stress in other people’s voices when they share news events to me. There are times when I tell them, “Maybe you should take a break from this stuff for a while.” Most times, the feedback response I get is, “But you have to stay informed with what’s going on in the world.” I can’t blame them for saying that because I use to say the same thing. However, I realized I was wrong. It’s okay to not know every single breaking news alert going on in the world. Rather than staying dialed into that stuff, I focus my attention on living a happy life doing the things I love. This is my normal approach to news. I wasn’t brought up with a TV on in the background and I find it saddens and exhausts me. I don’t particularly want to get desensitized either, so I keep my distance. It’s a strategy that leaves me with more energy and love for the people around me who I CAN help. This is great. I’ve been avoiding watching news for years now, mainly because of the negative slant of it – it just affects me too much. Thanks so much for the reminder to unplug, so that we can plug back into ourselves, and our lives. We very rarely watch the news anymore, and we always realize why we have chosen to avoid it when we do watch it. You are absolutely correct when you talk about the toll it takes on us. I only recently told my dad about our choice, and he was flabbergasted. He asked, “How do you know what’s going on?” To which I replied that there are many sources for news these days, and I do quite well with keeping up with current events. I think this was proven when it was never apparent to him that I don’t watch it. The only time we read the paper is when we’re on vacation, and only because it’s around. I have been a news mushroom for years – maybe even a decade. It just stopped interesting, and I stopped watching. And I do not feel at a loss about it. If it is important, it will get to me eventually, but I am glad I know little of the sensationalized shenanigans that are portrayed as news.